These stacks dado sets have built their own reputation for reliability and accuracy. Extra large carbide tips are used to the outside blades and cheaper teeth.Precision grinding ensures a perfect flat bottom cut dado with slight scribes on both sides of the dado. 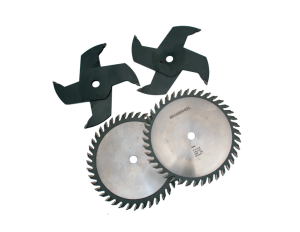 Each set consists of 2 outside blades and the following 2 wing chippers: 1-1/4″thickness; 2-1/8″thickness; 1-1/16″thickness. D1240 12" 40T Max Kerf 13/16" 1"
D840N – Negative Hook Outside Dado Blades. Outside blades are slightly thinner, producing dados that are 1/64″ undersize. Ideal for making dados in plywood and composite panels. Also recommended for radial arm saws.